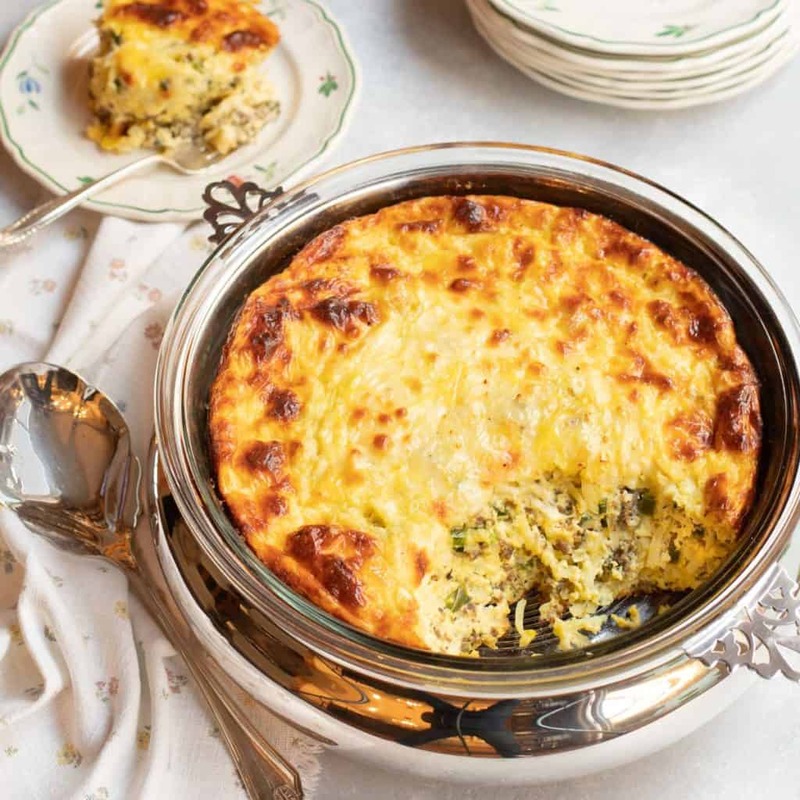 Easy enough for a casual weekend breakfast and elegant enough for an Easter brunch, this Sausage, Cheese and Hash Brown Strata will be your new go-to dish – and it’s gluten free! For the past few years, my husband Robert and I have invited a few friends to join us after church for an intimate Easter brunch. I always like to serve my Toasted Bagels with Egg Salad and Smoked Salmon and mom’s Mini Sticky Pecan Rolls (in my cookbook “Fresh Tastes”) – because who doesn’t love pecan rolls or egg salad? Because these two dishes represent a lot of bread, I’ve been playing around with creating a potato (instead of bread) based strata-type casserole to add to my brunch menu. After several variations, this Sausage, Cheese and Hash Brown Strata was the winner with our friends! So easy to prepare – you simply sauté sage-flavored sausage together with peppers, shallots and garlic, then combine with parsley and frozen hash browns. Eggs, milk, sour cream, Dijon mustard and four cheeses (yes, four!) are whisked together and poured over the potato mixture. After baking, the resulting dish is golden brown on the outside and moist and custard-y on the inside – and oh, so scrumptious! Preheat oven to 375 degrees. Butter or oil a 3-quart baking dish (9 by 13 by 2-inch rectangular or 9 1/2 by 3-inch round). In a large skillet or sauté pan, heat the oil over medium heat. Add the sausage and cook until no longer pink, stirring and breaking up into small pieces. Stir in the bell pepper, shallots and garlic and season with kosher salt. Continue cooking, stirring occasionally, until the peppers are soft, around another 5 minutes. Stir in parsley and remove from heat. Set aside. In a large mixing bowl, whisk eggs until yolks and whites are combined. Whisk in milk, sour cream and mustard (sour cream will be a bit lumpy but that’s okay). Stir in shredded cheese; season with ground pepper. Place frozen potatoes in a large mixing bowl. Stir in sausage mixture. Spread evenly in prepared baking dish. Spoon egg-cheese mixture over the top. Let sit for 5 to 10 minutes to allow the egg mixture to soak in. Bake for around 45 minutes (5 to 10 minutes longer if in round pan) or until the top is golden brown and set (casserole doesn’t jiggle when moved). Let sit for 5 to 10 minutes before serving. Gluten free: use gluten-free sausage and frozen hash browns. Make ahead: Casserole can be prepared but not baked up to 24 hours in advance, covered and refrigerated. Bring to room temperature before baking. Can also be baked ahead of time and reheated. Note about sausage: if you can’t find pork sausage with sage, purchase regular pork sausage, and when cooking, sprinkle with 1 to 2 teaspoons of dried sage.